• Why rate a forestry project? • How is sustainability considered in the rating? • Which forestry project types can be rated? FairForest provides three services: Metrics, Voluntary Rating and Verified Rating. The free available catalog of Metrics is the starting point for our ratings. For each rating a standardized questionnaire has to be filled in. On the basis of these voluntarily provided and non verified information OpenForest carries out the forest project rating. For an increment of information reliability OpenForests offers a desk review and a field visit to the project location to verify the provided information. The verification service is called FairForest Verified Rating. In the following documentation we will only use the term “Rating” as the underlaying methodology for the Voluntary Rating and the Verified Rating is the same. Register for the FairForest Rating. We will get in contact with you and let you know if the rating is suitable for your forestry project type. If yes, we will send you the Rating questionnaire. After submitting the filled in questionnaire, a FairForest staff member will review the questionnaire and schedule a call to confirm the status of the rating and where necessary help to complete the questionnaire. Submitted measurable questions (measurable indicators) will be weighted in accordance to their importance in relation to other questions within one section (e. g. social performance, environmental performance). Each question can perform between 0 percent (very low) and 100 percent (very high), depending on how the question has been answered. The performance of each section will be rated independently. Additional descriptive questions (descriptive indicators) provide valuable background information. The final rating report we will be send to you for your considerations. Go to example report to see how the report looks like. You decide who can read the fact sheet or the entire report. With your permission we will publish the rating date and your unique and anonymized rating identification number at the FairForest registry. Everyone with the report can now verify the rating status of your project. You can use the FairForest Logo in combination with the rating identification number. OpenForests offers to carry out a desk review and a field visit to verify the rating results (FairForest Verified Rating). The verification status will be visible in the registry and in the logo. Why rate a forestry project? We believe that there is a huge potential for responsible forest investments into sustainable forestry. However investments in this asset class are underrepresented. In large investment portfolios (> USD 1 billion) forests usually represent only around one percent of the total portfolio (Glauner 2011, p. 14). Already minor changes in the investment strategy can significantly increase the allocation of investments into the forestry sector. These potential investments can help to finance reforestation activities. But what is preventing investors from allocating investments into the forestry sector? The heterogeneity of sustainable forest ecosystems and the complexity of management tasks make forestry a difficult asset and require extensive experience and expertise. To unleash the full potential, risk assessment tools have to be developed in order to evaluate the performance of forest investments more accurately. At OpenForests we are working continuously on these tools. With our Rating we provide a tool for professional investors and forest project developers to evaluate sustainable forest investment opportunities. The rating focuses on the social and environmental impact as well as on the financial and management performance and furthermore considers the business environment and production risks. Current certificates and standards predominantly focus on environmental and social impact. The financial performance is not evaluated adequately. However we think that the financial sustainability is the prerequisite to guarantee social and environmental sustainability. Therefore the FairForest Rating especially asks for the business performance. Though, we believe that the long-term organizational success and the project stability depends on the equal existence and a high performance of social, environmental and financial criteria. This is especially true for long-term forest investments. FairForest provides metrics to measure an expanded spectrum of performance criteria for a better determination of involved risks. 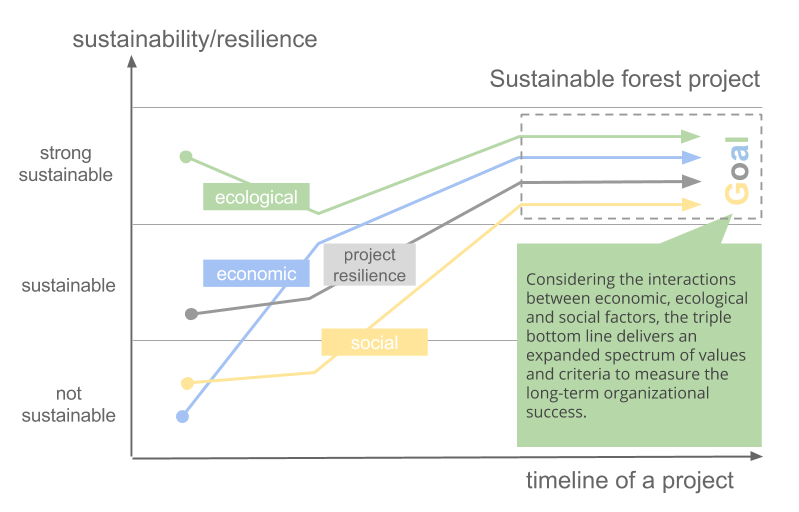 An equally high social, ecological and economic performance will increase the projects resilience and organizational success. By measuring indicators and grouping them in sections, complex investment subjects like sustainable forestry investments can be compared more easily. Comparing measured indicators with internal benchmarks enables responsible investors to select projects which fit best in their investment portfolio. The rating assists systematic deal sourcing to find high quality projects and save costs. How is sustainability considered in the rating? FairForest Ratings are based on the „Triple Bottom Line“ approach for the simultaneous consideration of multiple success criteria, with the intention to measure the social and environmental impact alongside a financial return. 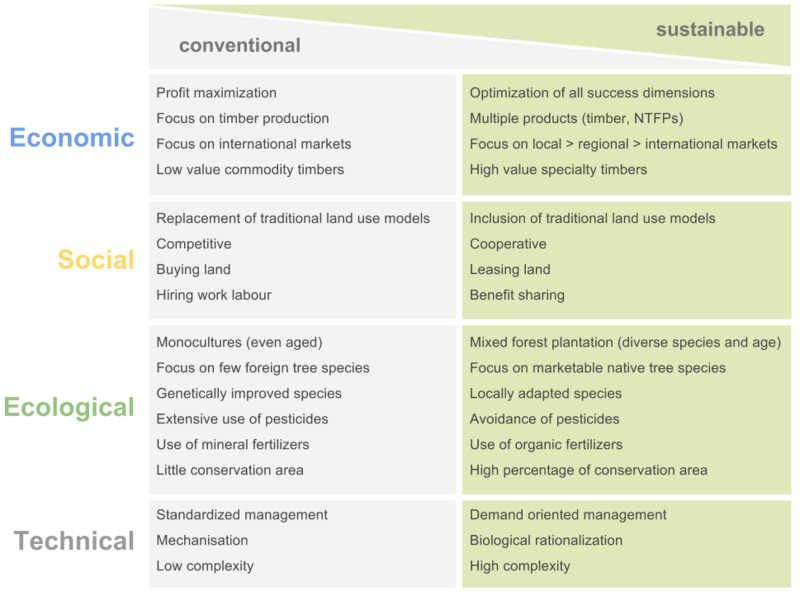 The following graph outlines the practical differences of conventional and sustainable forestry. Forestry projects with a sustainable approach are likely to obtain a higher rating performance than conventional projects. Find more information at Impact Investing for Sustainable Forestry. Which forestry project types can be rated? Each project needs to indicate at least one lead project type. However multiple project types and specifications can be combined. For example it is possible to rate a natural forest management project, with a non-timber forest product component, which includes carbon and ecosystem services. The rating allows to rate projects during different phases. The set of indicators will be selected according to the project status: to be initiated, expansion or existing. The FairForest Voluntary Rating is currently not a great fit for the evaluation of carbon accounting related indicators. However it could add great value to the measurement of all other sustainable management activities. The basis for the rating is a comprehensive questionnaire of over 170 descriptive and measurable indicators. The 56 descriptive indicators are not considered in the rating. However they provide comprehensive insights for decision making. Each rating report also includes the degree of completeness in percentage of answered descriptive indicators. Every section is rated independently and can perform between 0 to 100 percent. The overall rating is the average of all rating sections. 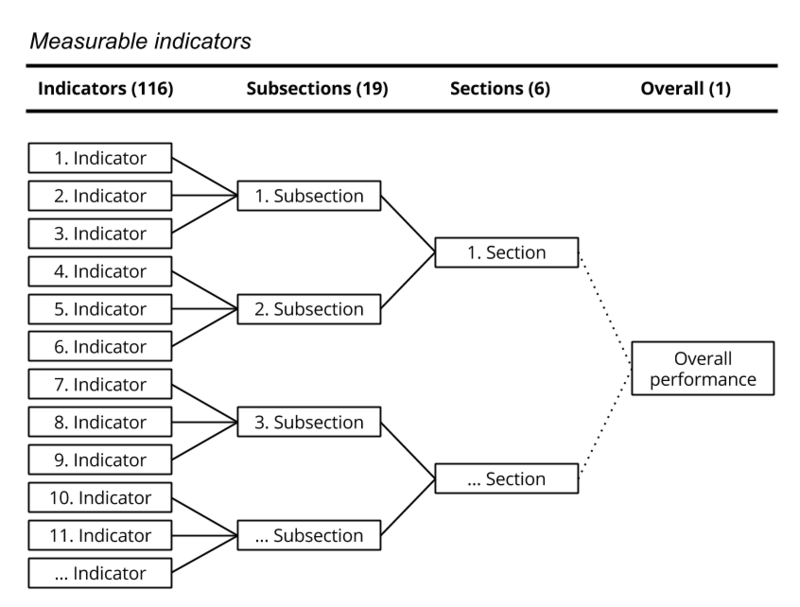 Indicators are grouped by subsections and subsections again by sections. The overall rating is the average out of all sections. The level of compliance for each indicator, subsection and section ranges can be between 0 (no performance) to 100 percent (maximum performance). By default each indicator shows no information which is equal to a performance of 0 percent. Indicators which are non relevant will be removed from the rating (e.g. “Distance to the next saw mill” for a pure carbon forestry project). The weight of the the remaining indicators will then be relatively higher. Practice shows that not every indicator could be assessed with the same certainty. For example it is easy to check the availability of a business plan, however it is much more difficult to estimate the severity and probability of potential future wind damages of a forest plantation. Therefore we have categorized the questions in accordance to the appropriateness to measure them. Depending on its importance within one section, each indicator is weighted in comparison to the other indicators of a section. For example, the indicator which asks for the country risk is much more important than the current intensity of the road network within the project boundary. The weight of one indicator is calculated by multiplying its measurability with its importance in comparison to the other indicators of the section (appropriateness * Importance = weight).